ITEM NO. SUBJECT PAGE NO. MINUTES OF A Meeting of the Busselton City Council HELD IN the Council Chambers, Administration Building, Southern Drive, Busselton, ON 11 February 2015 AT 5.30pm . The Presiding Member open the meeting at 5.30pm. The prayer was delivered by Captain Tim Watson from Busselton Salvation Army. Does Council realise that item 7.2, paragraph 2 of the City of Busselton Council minutes dated 26 November 2014 misrepresents the position of the 1600+ members of the Busselton & Dunsborough Dog Beach Action Group? This is a matter for the Council, however, it is standard practice for an indication to be included in the minutes of a meeting of whether a speaker generally agrees or generally disagrees with the recommendation of an officer. It was assessed that the position of the speaker on behalf of the Busselton and Dunsborough Dog Beach Action Group was more in keeping with the Officer Recommendation than with the alternative motion that had been proposed by a Councillor. Will Council take action to correct the statement in item 7.2, paragraph 2 of the City of Busselton Council minutes dated 26 November 2014 to indicate that the Busselton & Dunsborough Dog Beach Action Group did NOT support the officer recommendation in this matter? As indicated to Ms Smailes, the minutes have already been confirmed as a true and correct record of the meeting. However, these questions and answers will appear in the minutes of tonight’s meeting and will put on public record the views of the Busselton and Dunsborough Dog Beach Action Group. Does Council believe it is fair & reasonable that when questioned about how to correct this misrepresentation, the reply from the relevant Council officer was basically “sorry, the minutes have already been passed as a true & correct record” without then providing advice as to what could be done about it? This is why we’ve chosen to ask these questions as part of Public Question Time, to ensure we have an avenue for redress. This is a matter for the Council, however, this is an appropriate mechanism for redress and correction of the public record. Does Council believe it is fair & reasonable that a person making a presentation is to be judged as for or against an officer recommendation without first being advised that they are going to be judged & recorded in that matter? This is a matter for the Council, however, this is standard practice and has never before been brought into question. The Governance Services Team apologises for the unfortunate misrepresentation. Will Council review clause 6.10.2.c of the City of Busselton Standing Orders Local Law which currently permits officers to make value judgements & assumptions relating to presentations that are not necessarily in accordance with the position of the presenter? This is a matter for the Council. Mr Rob Griffiths asked if the City consider placing some gravel at the bird watching area located on Layman Road, near the Wilmott’s property to provide a safe pull over area for bird watchers to use? As part of the overall upgrade of Layman Road, the City will be constructing a parking bay which will allow parking for 3 vehicles. This will be located on the southern side of Layman Road between the intersections at Avocet Boulevard and Armitage Drive. This location is very popular with birdwatchers and the new parking bay is being installed primarily to accommodate drivers who want to view the birds and take photographs. Mr Griffiths commended the Council on the beachfront which is looking beautiful however, what are we doing with the Vasse River? Would the Council consider placing a bung across the drain which is located behind the golf course? The drain referred to in the vicinity of the Golf Club is the Vasse Diversion Drain that’s under the care and control of Water Corporation – the question of placing a bung across the drain will be referred to Water Corporation for their comments. Mr Neville Wheatman asked when the street verges at 33 Davies Way and 24 Davies Way were scheduled for kerbing. A request to attend to the damaged kerbing on 33 and 24 Davies Way was registered with the City’s Depot – Maintenance crew and kerbing is now in place. Ms Lucy Smailes asked whether Council would consider matters raised by her during public question time (above) at the Council meeting on 28 January 2015. Cr Stubbs advised Ms Smailes that Council has no intention to review the Standing Orders and that such a review is only required to be conducted by Council every eight years. Cr Stubbs also advised Ms Smailes that the minutes of the 26 November 2014 Council meeting were confirmed as a true and correct record. An alteration can only be made if a Councillor wishes to come forward with a motion to alter the decision. Mr Bill Gillbard asked why he had not received any response from correspondence sent to City Councillors and staff. Cr Stubbs advised Mr Gillbard that he was not aware of any correspondence being ignored and invited Mr Gillbard to discuss the matter further following the meeting and potentially organise a meeting with himself, Deputy Mayor and CEO. The Presiding Member congratulated Cr Grant Henley, community members and staff involved in the lead up and conduct of the Jetty 150th Celebrations and the celebration of the 20th Jetty Swim. The celebrations were a great success due to all of those who were involved. That the Minutes of the Council Meeting held 28 January 2015 be confirmed as a true and correct record. 1) That the minutes of a meeting of the Meelup Regional Park Management Committee held on 13 January 2015 be received. a) The Committee discussed two potential plans for the Meelup Beach Carpark Design and in response to this discussion a motion was put forward in support of the plan with 54 parking bays and with a number of specific conditions. A report addressing this will be presented to Council at a future meeting. b) The Committee noted the Environment Officer’s report. At this juncture the Mayor advised the meeting that with the exception of the items identified to be withdrawn for discussion, that the Officer Recommendations will be adopted en bloc. A City of shared, vibrant and well planned places that provide for diverse activity and strengthen our social connections. The Council is requested to consider adopting for final approval a draft Developer Contributions Plan (DCP) for Dunsborough Lakes Estate. The DCP outlines the developer’s responsibilities for contributions towards district level active open space and associated facilities on Lot 9033 Commonage Road, Dunsborough Lakes. The draft DCP was advertised according to Local Planning Scheme No. 21. One submission was received however no substantive issues were raised. Officers are recommending that the DCP is adopted for final approval. The DCP has been prepared to comply with the requirements of the City of Busselton Local Planning Scheme No. 21 and the Dunsborough Lakes Development Guide Plan. The DCP is provided at Attachment A. The DCP is applicable to Lot 9033 Commonage Road, Dunsborough Lakes which is zoned Special Purpose (Dunsborough Lakes Development Area). The Dunsborough Lakes Development Guide Plan (DGP) identifies Lot 9033 for residential and related purposes. The developer contributions area and the Dunsborough Lakes DGP are provided as Attachments B and C.
The DCP deals with cost contributions towards the provision of district level active open space and associated facilities and infrastructure. The per lot contribution is set at $5,000 (but will be adjusted in accordance with the Local Government Cost Index WA) and, depending upon an estimated yield of between 250 - 300 lots, the funds collected could be in the vicinity of $1.25M to $1.5M. The City will set up and keep an account under the Local Government Act 1995 for funding local assets and community facilities under the DCP. The purpose of the account is to ensure that the expenditure of funds from the developer contributions is limited to the purposes set out in the DCP. Interest earned on cost contributions will be credited to the account. The key elements of the statutory environment with respect to the DCP are set out in the relevant objectives, policies and provisions of the City of Busselton Local Planning Scheme No. 21 and the Dunsborough Lakes Development Guide Plan. Each is discussed below under appropriate subheadings. Officers have prepared the DCP to satisfy the requirements of LPS21. The DCP has been progressed in accordance with clause 7.7 of LPS21, including advertising and consideration of any submissions received. Final adoption by the City and endorsement by the Western Australian Planning Commission are required to conclude scheme requirements. The endorsed Development Guide Plan (DGP) for Dunsborough Lakes establishes land use designations (zones) pursuant to LPS21 and provides the overarching framework for subdivision and development. The DGP identifies Lot 9033 for residential, public open space and primary school purposes. Condition 22 of the DGP requires that the preparation of a DCP precedes subdivision or development of the land. The key policy consideration in relation to the DCP is the WAPC State Planning Policy 3.6: Development Contribution Policy for Infrastructure (SPP3.6). SPP3.6 sets out the principles and considerations that apply to development contributions for providing infrastructure in new and redeveloping urban areas as well as the form, content and procedure for preparing a DCP. The policy provides flexibility to formulate development contributions which go beyond the standard subdivision development contribution requirements, either by a Developer Contributions Plan or by a voluntary agreement between the developer and the relevant local government. · Other costs reasonably associated with the preparation, implementation and administration of a developer contributions plan. Officers consider that developer contributions towards district level active open space and associated infrastructure is consistent with the state planning policy framework. The state planning framework requires developers to contribute towards infrastructure, but does not require developers to make any financial contributions towards community assets beyond the initial capital requirements. The City is responsible for maintaining the infrastructure items. Officers have undertaken an assessment of the potential implications of carrying out the officer recommendations using the City’s risk assessment framework. The assessment identified ‘downside’ risks only, rather than upside risks as well. The medium risks associated with DCPs are a shortfall in funds or the disposal of land prior to subdivision or development. The draft DCP has been specifically designed to mitigate these risks to an appropriate level. Implementing the Officer Recommendation will involve advising the applicant of the Council resolution and referral of the DCP to the Western Australian Planning Commission. There are no significant risks identified. The DCP has been drafted in cooperation with the developer to ensure the principles of the plan are supported by both the City and the developer. In accordance with clause 7.7.4 of LPS21 the draft DCP was advertised for 28 days. Advertising closed on 19 December 2014 and one submission was received. The matters raised are not considered by officers to be substantive for the reasons set out in the ‘Officer Comment’ column of the Schedule of Submissions at Attachment D.
The draft DCP applies to a relatively small portion of the overall Dunsborough Lakes Estate area and the anticipated lot yield will be commensurately low. The Dunsborough Lakes Development Guide Plan designates a significant portion of the DCP area for recreational open space/playing fields to be utilised on a shared basis with the adjacent future primary school (the Department of Education is planning to open an educational annexe on the primary school site in 2016). Until relatively recently there has been no statutory mechanism to enable the City to require developer contributions towards the provision of new recreational facilities within Dunsborough Lakes Estate and as such the City has not collected contributions for the district level open space to date. Therefore it is seen as important and logical that all contributions generated by the future subdivision and development of Lot 9033 be put towards the delivery of the district level active open space and its associated facilities within the DCP area. In this particular context this is seen as a better approach than collecting funds to be distributed to projects around the District and reflects the somewhat unique circumstance of the site, and Dunsborough Lakes in general, in terms of the developer contribution. The approach will result in a per lot contribution that is commensurate with Yalyalup (Provence). Officers are recommending that the draft DCP be adopted for final approval pursuant to Local Planning Scheme No. 21. Option 1: Resolve not to adopt the draft Developer Contributions Plan for final approval. Option 2: Resolve to adopt the draft Developer Contributions Plan for final approval, subject to modifications. The assessment did not reveal any substantive issues or reasonable grounds that would support either option. Implementation of the Officer Recommendation will involve providing advice of the Council resolution to the developer and referral of the DCP to the Western Australian Planning Commission for endorsement. This will occur within one month of the resolution of the Council. That the Council, pursuant to the City of Busselton Local Planning Scheme No. 21, adopts the draft Dunsborough Lakes Developer Contributions Plan dated October 2014 (Attachment A) for final approval and referral to the Western Australian Planning Commission for endorsement. Infrastructure assets are well maintained and responsibly managed to provide for future generations. The Council is requested to consider the tenders received in response to Request for Tender RFT26/14 Supply & Laying of Extruded Kerbing. The purpose of this report is to obtain the Councils consent to award Tender – RFT26/14 in accordance with the Tender Evaluation panel recommendation. This Request for Tender specified the requirements of the City and invited suitably qualified and experienced respondents to submit bids to enter into a Contract with the City of Busselton for the supply and laying of extruded kerbing within the City of Busselton. Subject to the Principal’s right to early termination the term is for a period of three (3) years from the date of award, with two (2) optional one (1) year extensions to be exercised at the Principal’s discretion. Three (3) submissions were received in response to this Request for Tender. Submissions were received from Proline Kerbing, Action Kerbing and Jetline Kerbing Contractors. The review process for these three (3) submissions has been finalized by the Tender Evaluation Panel which comprised of the following City of Busselton Officers. Part 4 (Tenders) of the Local Government (Functions and General) Regulations 1996 requires a Local Government to publicly invite tenders for goods and services where the value of those goods or services exceeds, or is expected to exceed, $100,000. Over the course of the proposed contract term, the goods and services the contractor will provide will exceed $100,000. The following Council policies have relevance to the Tender process. The procurement process complies with this policy. The Regional Price Preference was applied to this tender. The application of appropriate selection criteria via the tender process has contributed to ensuring that the successful tenderer is offering the "best value" with respect to the supply and laying of extruded kerbing within the City of Busselton. There has been a one (1) percent reduction in the recommended Tenderers rates, when compared against the current tender submitted for these services in 2010. The costs of services within this tender are provided for in capital works and operational budgets for each financial year. Purchasing under this contract will be in accordance with these adopted budgets. managed to provide for future generations. The objective of this tender is to select a Contractor who best demonstrates the ability to provide quality kerbing supply and laying services across the City of Busselton. The risk has been categorized as an low (L5, unlikely with minor operational consequences). The risk has been assessed in this manner because the successful contractor has historically demonstrated the ability to deliver on the services as identified in the Tender document. The provision of referees and financial profile information further reinforces the City’s confidence in the appointment as the Contractor is well-established, has the financial capacity to fulfil the contract and the risk of insolvency is low. As part of the tender evaluation an initial compliance check was conducted to identify submissions that were non-conforming with the immediate requirements of the RFT. This included compliance with contractual requirements and provision of requested information. All submissions were deemed to be materially compliant. · Relevant Experience: 20% - a review of relevant work experience, including relevant referees. · Key Personnel Skills and Experience: 10% - detailing the skills and experience of key personnel. · Tenderers Resources: 20% - detailing the company’s ability to fulfil the contract requirements. The Tendered price was given the following weighting and has been assessed in conjunction with the Qualitative Criteria. The submission from Jetline Kerbing Contractors demonstrated that they have been operating since 2000 and have kerbing experience with City of Bunbury, Town of Port Hedland and Main Roads contractor Fulton Hogan, plus mine site kerbing. The Bunbury based company employs 18 staff with a range of experience - kerbing leading hand 8 years experience, other leading hand/ supervisors with 2 - 20 years experience, Manager and Director with 18+ years experience. Resources are spread between South West and North West WA, it is not clear what resources are available specifically to this contract. Fleet includes suitable plant and equipment. With their depot located in Bunbury they are within close proximity to Busselton. The submission from Action Kerbing demonstrated that they have been operating for approximately 15 years and have kerbing experience with Shires of Collie and Dardanup and several local civil contractors. Current owners purchased in 2012. The Busselton based company employs 2 full time staff (Director and Apprentice) plus 2 part time staff and experienced sub-contractors (previous owners). The trenching equipment included within their submission may slow their production rate, compared to the use of typical Ditch Witch type equipment used for this task. Contingency based on relationships with other kerbing contractors. With their depot located in Busselton they are within very close proximity to potential kerbing projects. In order to evaluate the pricing component of the tender and estimated annual requirement scenario for the supply and laying of kerb was applied to the tendered rates. When the pricing component of the Tender was added to the Qualitative scores, the submission from Proline Kerbing represented the best value for money for the City of Busselton. This report seeks the Council’s endorsement of the officer’s recommendation to award the Contract to Proline Kerbing in accordance with the Terms and Conditions as specified in RFT26/14 Supply & Laying of Extruded Kerbing, as their submission represents the best value for money option for the City of Busselton, demonstrating the company’s ability to complete the contract requirements to the standard required and within the time frames required at a competitive price. 1. The Council may choose not to accept the officer’s recommendation to award the contract to the preferred tenderer and not award any tender. Given the statutory requirements to seek public tenders for this work, the City would then need to either (a) seek alternative tenders by re-advertising or (b) appoint a contractor on the WALGA Preferred Supplier Panel. Both alternatives would result in a delay to appointment of a contractor, resulting in the delay of critical works and there is no guarantee that a better value outcome could be achieved. The selection of a preferred Tenderer can be announced immediately after the Council has endorsed the officer’s recommendation. Award of the tender to the preferred Tenderer will be subject to successful negotiation of minor contractual issues. The successful Tenderer will receive formal written notification within seven (7) days of completing the negotiations. All unsuccessful tenderers will also be notified in this time. 1. Award the Contract resulting from RFT26/14 Supply & Laying of Extruded Kerbing to Proline Kerbing in accordance with the terms and conditions contained within the tender for a period of three (3) years with an option of up to two (2) one (1) year extensions, exercisable at the Principal’s discretion. Governance systems that deliver responsible, ethical and accountable decision-making. Reporting Officers - Various . This report provides an overview of a range of information that is considered appropriate to be formally presented to the Council for its receipt and noting. The information is provided in order to ensure that each Councillor, and the Council, is being kept fully informed, while also acknowledging that these are matters that will also be of interest to the community. Any matter that is raised in this report as a result of incoming correspondence is to be dealt with as normal business correspondence, but is presented in this bulletin for the information of the Council and the community. “Just a quick note to thank you for making the effort to come down to our event last Saturday. The new ramp has already proved its worth, with many comments from those with mobility problems or in chairs (or those pushing). Our day kept growing through the morning finally ending up with 54 participants, 33 carers and 132 volunteers; probably one of our biggest days. “I wish to take this opportunity to sincerely thank you and the City of Busselton for nominating Busselton Hospice Care Inc. as beneficiaries of the 2014 Mayoral Prayer Breakfast held at Geographe Bayview Resort in September. The proceeds raised from such an event, being $4,623.97 is not only amazing, but quite heartwarming and humbling. The generosity of our local community is astounding. The funds received will assist us to ensure Hospice continues to provide much needed support to those in need at such a difficult stage of life's journey. On behalf of the committees, the staff and volunteers, thank you once again for your continuous support and acknowledgement of our service. A copy of the 2013/2014 South West Academy of Sport Annual Yearbook and Report has been received and is available to be viewed in the Councillors’ Office. Attachment A is a report detailing all Planning Applications received by the City between 1 and 15 January, 2015. Seventeen formal applications were received during this period. Attachment B is a report detailing all Planning Applications determined by the City between 1 and 15 January, 2015. A total of twenty applications were determined by the City during this period with all approved / supported. At this juncture, in accordance with Clause 5.6 (3)(a) & (b) of the Standing Orders, those items requiring an Absolute Majority or in which Councillors had declared Financial, Proximity or Impartiality Interests were considered. This report is presented to enable Council to appoint a new member to a working group run by the City on which Councillors participate. The City proposes to nominate (1) additional Councillor for the Waste Advisory Group, in addition to Cr Terry Best, previously nominated. The Waste Advisory Group currently comprises the following members: Cr Terry Best, Director Oliver Darby, Manager George Workman, Waste Coordinator Vitor Martins and Waste Management Officer Allan Miller. This group allows Council to keep informed on the progress in this area, to provide officers with timely input on a number of important matters and to represent the City in relevant outside forums. Under Section 5.8 of the Local Government Act 1995 (LG Act), a local government, by absolute majority, may establish Committees of three or more persons to assist the Council, and to exercise the powers and discharge the duties of the local government that can be delegated to committee. Section 5.10 and 5.11A of the LG Act relate to the appointment of Committee members and Deputy Committee members. While this appointment relates not to a Committee, but to an informal working/advisory group – the Waste Advisory Group – the same procedure is being followed here for the purpose of clarity and transparency in decision making. None specific to the appointment of members to Committees or groups as these have been recognised in the current budget and corporate plan. However, external representation needs to be considered in the context of the entitlements provided in the Fees, Allowances and Expenses for Elected Members policy. Therefore, before making such an appointment the Council needs to be satisfied that there is a benefit to the local government by a Councillor being a representative of the Council. Councillors can and do still attend a range of meetings and groups in their personal capacity rather than as a representative of the Council. The practice of matters being considered by various Committees and groups established by the Council contributes to Governance systems that deliver responsible, ethical and accountable decision-making. The Waste Advisory Group recommended by Officers currently has a single member Councillor – Cr Terry Best. The City is progressing several relevant waste infrastructure projects, including construction of the new Busselton transfer station, expansion of the Dunsborough Waste Facility landfill, investigation of potential new waste disposal sites and research and planning for the potential development of a waste to energy solution for the Southwest. On the policy side, the City also sits in the Western Australian Local Government Association (WALGA) Municipal Waste Advisory Council (MWAC), which requires formal representation to discuss and decide on WALGA’s positions, proposals and activities regarding a number of issues related to waste management policy. In addition, the Department of Environment Regulation is inviting written submissions to inform the Waste Avoidance and Resource Recovery Act review. This legislation was enacted in 2007 and is the cornerstone of waste policy in WA. In addition to contributing to WALGA’s input, the City might want to submit its own contribution in the near future, which would be best discussed within the City’s Waste Advisory Group. Given the broad scope and importance of the challenges that the City faces in regards to waste management matters, it is the officer’s opinion that a group with two Councillors would best promote the objectives of the City and the group, also guaranteeing adequate Council representation. Councillor John McCallum has expressed interest in being a part of this Waste Advisory Group. In order to continue the valuable progress made with several waste infrastructure projects, investigation of potential new waste disposal sites and potential development of waste to energy solutions for the Southwest, it is recommended that an additional member, is appointed as a City representative to the Waste Advisory Group. The Council may determine that a single member representation on the Waste Advisory Group is sufficient. It may also determine that a representative on any of the other organisations is not required, thus further justifying the one member option. The appointments would be effective immediately. Councillor __________________ as a representative to the Waste Advisory Group. Note: Councillor Tom Tuffin put forward and Alternative Motion for Council to consider appointing two additional members to the Waste Advisory Group. Councillor Jenny Green and Councillor John McCallum as representatives to the Waste Advisory Group. Officers have undertaken a review of the options available and the approximate costs for the method by which the City of Busselton conducts Local Government Elections. In accordance with the Local Government Act 1995, Council can opt to conduct an election either as an in-person election or a postal election. Legislation dictates that if a Council decides to conduct a postal election, the Western Australian Electoral Commission (WAEC) must conduct the election, with the cost of the election to be recouped by the Commission on the basis of full accrual cost recovery. In May 2011, the City of Busselton Council entered into an agreement with the Western Australian Electoral Commission, engaging WAEC to undertake all elections for the City of Busselton as postal elections until the end of 2015. Any change in Council position will require an absolute majority decision of Council to formally advise the WAEC that the City will conduct its own election and appoint, as per the Act, the CEO (or his representative) as Returning Officer. It is recommended that the City continues to conduct its elections as postal elections managed by the WAEC. However, it is noted that had the City been legally entitled to conduct its own postal election, then this would have been the recommendation of officers. Local government elections occur on the third Saturday in October every two years. Councillors each serve four year terms which are overlapping, to ensure continuity within a Council. In 2013 the City of Busselton had four positions contested at the election, with the remaining five positions due to be contested at the next local government election to be held in October 2015. The Act provides that a local government may decide whether to conduct a postal election or hold an in-person election. Legislation requires that where a local government opts for a postal election, the election is to be run by the WAEC. A report provided by the Western Australian Local Government Association (WALGA) that was presented to State Council in March 2012 identified the issue of the WAEC monopoly of postal elections. WALGA State Council has previously expressed a view the WAEC monopoly in the running of postal voting elections should be opened up to provide opportunity for Local Governments to have access to alternative arrangements, including but not limited to managing their own postal elections. Contact with WALGA indicates that the Association continues to support and is still advocating for this change to the legislation. It does however require the consent of two separate Ministers, being the Minister for Electoral Affairs and the Minister for Local Government, and is unlikely to be achieved in the short term. The report concluded with a recommendation that WALGA continue to advocate for an appropriate amendment to the Local Government Act that will address principles of price competitiveness and consumer choice in the conduct of postal elections. To date there has been no progress with the required change in legislation to enable local governments to conduct their own postal elections. Where WAEC is engaged to run the election, the election may be conducted as a voting in-person or a postal election, with the Returning Officer appointed by the Commissioner. If the local government chooses to conduct the election in house, the only option is for an in-person election, with the Chief Executive Officer or his representative appointed as the Returning Officer. The Local Government (Constitution) Regulations 1998. Council policy 038 ”Promoting a Diverse Council and Participation” seeks to encourage all people who are eligible to do so to participate in elections for Councillors of the City of Busselton. It is the view of officers that this is best achieved by conducting a postal election. When WAEC is engaged, they will conduct the election on a full cost recovery basis. In 2013, the cost to the City of Busselton from the WAEC for conducting the Local Government election was $70,500. On top of this cost, charges were incurred by the City for local advertising and the City’s staff to conduct the vote count on election evening. By running the election as an in-person election, it is considered that the printing and production costs for all election related material would be at least that incurred by the WAEC given the economies of scale that the Commission can achieve by running more than 70 elections at once. Therefore, the only savings that could realistically be identified are those associated with the Returning Officer appointed by the Commission and the costs associated with other WAEC staff input, amounting to $20,000. These costs would be absorbed by the City by these functions being performed by existing staff, however, this would have a resourcing impact over a number of months on the Governance Services business unit. It is also noted that election day staff costs would increase by the need to man a number of polling booths throughout the District for the whole of election day, in addition to the requirement for staff to count the votes at the close of the poll. This is conservatively estimated at $7,500. In order to ensure community awareness of the need to now attend a polling booth on election day after many years of not having to, a more significant advertising and awareness campaign would also be required. Dependent on the number of booths established and the significance of the advertising campaign, a significant proportion of the potential $20,000 saving could easily be required for these purposes. Clearly the scale of an election will impact on cost. The smallest election conducted by the Commission was the Shire of Cue with 166 electors. The largest was the City of Stirling, with 132,920 electors. The average cost per elector increased by approximately 9% for the October 2013 elections in comparison to the 2011 elections. This was mainly due to a postage rate increase of 17% and an 8% increase in staff pay rates. Nevertheless, the Commission has been successful in constraining the election costs paid by local governments over the past decade. This is demonstrated by the fact that in 2003 the State-wide average cost per elector at postal elections run by the Commission was $2.73. At the 2013 elections the average cost per elector was still only $2.89, despite CPI rises and increases in postage and labour costs. Increasing economies of scale and the adoption of various efficiency innovations have enabled postal election cost increases to be kept to a minimum. Direct cost comparisons with local governments who have recently conducted in-person elections have been difficult due to there not being any larger local governments to have conducted in-person elections in recent times. On that basis, it has only been possible to estimate that the costs incurred by the local government for the majority of election related materials would be equal to or more than those incurred by the Commission and to only eliminate direct Commission staff costs that could be absorbed into existing City operations. The City’s Long-term Financial Plan makes provision for the conduct of a postal election by the WAEC every two years. - A Council that engages broadly and pro-actively with the community. - Governance systems that deliver responsible, ethical and accountable decision making. - An organisation that is managed effectively and achieves positive outcomes for the community. cited a large proportion of absentee landowners, the method of postal voting was seen as a practical, fair and equitable method of voting, with the aim to achieve the best possible rate of return. The nearest like local government authority to Busselton that conducted their own election in 2013 is the Shire of Derby-West Kimberly. With a population base of 10,047 people, the situation of this local government is significantly different to the City of Busselton, being situated in a remote part of northern Western Australia, spread over 54 indigenous communities and two main townships (Derby and Fitzroy Crossing) over 250km in distance apart. A recent conversation with the Manager of Corporate Services indicated that the Shire of Derby-West Kimberly will also seek to have the WAEC conduct its next election as a mix of postal and in-person to reduce the impost on staff resources and provide a greater level of impartiality, particularly in the indigenous communities where there are lower literacy levels and language barriers. Local government elections can be either a postal election, which is an election at which the method of casting votes is by posting or delivering them to an electoral officer on or before election day, or a voting in-person election. · Voters are required to attend a polling place within the municipality on election day. · Consistent with State and Federal election voting methods. · Statistically has a lower voter participation rate compared to postal voting, especially in larger local government areas. · Incorrectly enrolled voters are more effectively managed. · Impost on staff resources. · No need for voters to attend a polling place on the specified day of election. · Provides more time for completing the ballot paper. · Better enables aged, infirm and disabled voters to participate in the election. · Higher voter participation rate compared with attendance voting. · More difficult to manage incorrectly enrolled voters. · Generally, postal voting has resulted in lower levels of informal votes than attendance voting. The City has engaged the WAEC to conduct local government elections since 1999. In 2013 the WA Electoral Commission conducted 76 postal elections and two voting in person elections on behalf of 78 of the 138 local governments across Western Australia. This represents 55% of LGAs in WA choosing to conduct postal elections and represented 93% of the Western Australian elector base. It is noted that the 44 LGAs with numbers of electors in contested wards ranging from Joondalup (107,845 electors) to Gingin (4,321 persons) all had the Electoral Commission conduct their elections. Of the 62 local governments opting to conduct their own elections, (all with an elector base of or below 4,000) only one was located within the metropolitan area (Town of East Fremantle) and only 29 of those 62 proceeded to election. This is typical of local governments with a smaller elector base, therefore historically having less of an impact on staff resources for elections conducted in house. 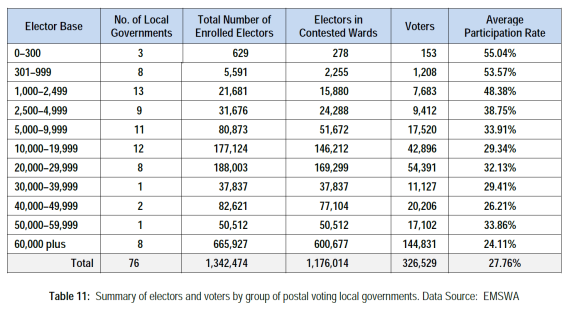 While elector participation is generally higher for local governments with smaller elector bases, figures provided by WAEC and the Department of Local Government show it is also evident that postal elections typically result in higher participation rates than in person elections – except for those local governments with an elector base of less than 300. · Convenience of casting a vote in their own homes – particularly for disabled and aged voters and those without access to transport. · Provision of candidate profiles to each elector to assist in their decision-making. · Time to contact candidates and make an informed decision. · Reduced costs in time and travel in casting a vote. · Availability of an experienced Returning Officer “at arm’s length” from Local Government business. · Detailed candidates’ guides prepared by the Electoral Commission. · An opportunity to reach all eligible electors at no cost through the candidate profile. · Confidence that the election is being run by the State’s independent Electoral Commission. · Elected candidates have an increased support base. · All eligible electors are given information about the election. · Electors can vote more easily as there are virtually no barriers to voting. · Elections are seen to be conducted by the impartial Western Australian Electoral Commission. · The workload for the CEO is reduced in an area that is not core business. · The vast majority of elector and candidate enquiries are received and resolved by either the Returning Officer or the Electoral Commissioner. · Economies of scale can reduce some of the costs (advertising). these elections, the local governments concerned ensure that elections are conducted independently and with impartiality. In addition, for those adopting postal voting, local government is adopting a method of conducting elections that is more convenient for electors and typically, especially for local governments with a larger elector base, achieves a higher rate of voter participation. Historically, large metropolitan local governments would often record a participation rate of less than 10% when utilising in person ballots. The City of Bunbury conducted two extraordinary elections in 2006 and 2008 as in-person elections. While these examples would not be cited directly as potential comparison points for the City of Busselton’s consideration of this matter due to the very different nature of extraordinary elections, it is concerning to note that the participation rates in these elections were 1.76% and 2.3% respectively. The elector base of local governments who chose to conduct a postal election in 2013 comprised of 1,342,474 electors, which is about 93% of the State’s total number of eligible electors. The City of Busselton maintains a higher than State average participation rate. Of the 61 local governments opting for an in-person election, only 32 proceeded to election. East Fremantle was the only metropolitan based council to conduct in-person voting in 2013 and had a return rate of 21.07%, which is less than state average, and less than the City of Busselton. While elector participation is generally higher for local governments with smaller elector bases, it is also evident that postal elections typically result in higher participation rates than in person elections. These figures supplied by WAEC suggest that local governments continuing to use the voting in-person method of voting may not be representative of the whole community. As voting in local government elections is not compulsory, the community may have an interest but not feel compelled to attend a polling place for the purpose of casting their vote and the postal method may be a means by which local government can encourage community participation. Since first trialled in 1995, the number of local governments adopting postal elections has progressively increased. 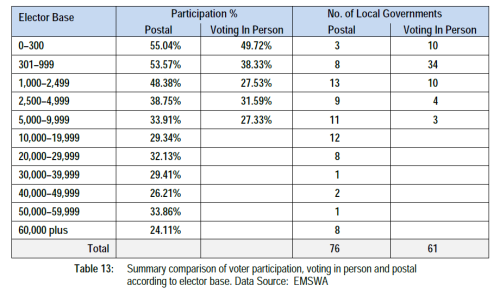 With voting in local government elections being non-mandatory in Western Australia, postal elections have typically resulted in a higher participation rate by eligible electors than in-person ballots, as they offer most electors greater convenience and accessibility. Making the Electoral Commissioner responsible for these elections also enables local government CEOs and staff to remain at arms-length from potentially contentious aspects of the electoral process. The Commission is able to ensure these elections are conducted independently, professionally and with absolute impartiality. Costs associated with WAEC vs costs associated with in house, in-person elections have to be weighed up against favourable outcomes of higher voter participation and the community consultation objectives of local government. Until such a time that there is a change to legislation enabling local governments to conduct their own postal elections, this method is only available be engaging WAEC. This report was required to be presented to the Council as a potential cost-saving mechanism following a significant review of the City’s budget by the Finance Committee. It is concluded that the potential cost savings associated with the proposal to consider an in-person election in 2015 would not be significant enough to outweigh the risk of a significant reduction in elector participation. In any event, in order to adequately mitigate this risk, it is believed that some of the cost savings would need to be invested in an advertising and awareness campaign, potentially resulting in close to a cost neutral decision, but with resourcing implications for the Governance Services business unit. Another consideration for the Council could be to seek further advocacy participation from WALGA to raise this issue with Government again in order that local governments would be able to conduct their own postal elections. Council can opt to continue to engage Western Australian Electoral Commission to conduct local government elections via postal vote or Council can opt to conduct elections in house. In accordance with the Local Government Act the WAEC will need to be informed of Council’s preferred option of the way in which the election will be conducted at least 80 days prior to polling day. Therefore a Council decision will need to be made by June 2015. 2. seeks further advocacy participation from the Western Australian Local Government Association to promote the local government industry’s desire to be able to conduct postal elections without engaging the Western Australian Electoral Commission. Councillor Tom Tuffin asked about the response to his question taken on notice at the 28 January 2015 meeting in relation to the Ambergate Hall and the plans for its future. The CEO advised Cr Tuffin that due to the Director, Finance and Corporate Services being absent from the office unexpectedly, an answer had not yet been provided however assured Cr Tuffin that a response will be given at the Council meeting on 25 February 2015. Note: Councillor John McCallum also wished to congratulate Councillor Grant Henley and staff for organising the Jetty 150th celebration which was held on Saturday 7 February. The meeting closed at 6.43pm. THESE MINUTES CONSISTING OF PAGES 1 TO 30 WERE CONFIRMED AS A TRUE AND CORRECT RECORD ON Wednesday, 25 February 2015.